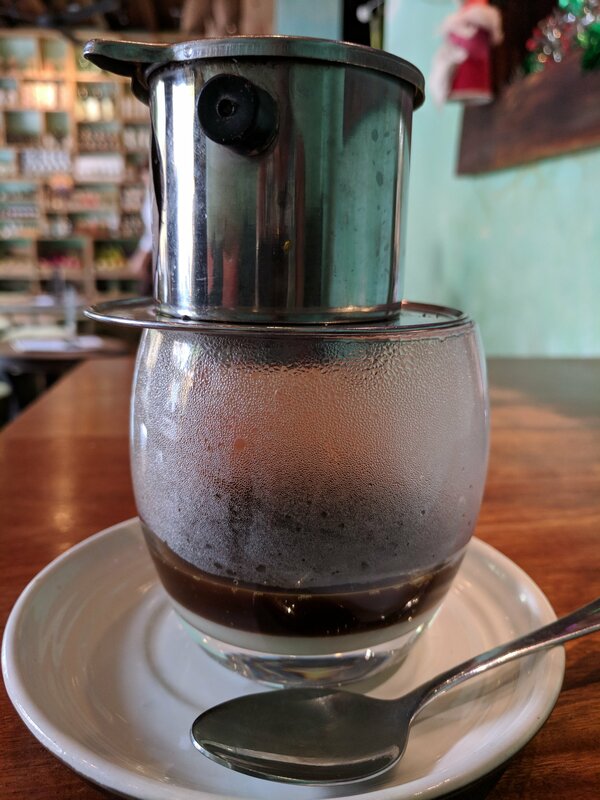 Vietnamese Coffee (ca phe sua) is an amazing thing – smooth, thick, layered with condensed milk, it goes down like a caffeinated version Mexican hot chocolate, it feels bad for you, in a decadent, “treat yourself, it’s winter, you can gain a couple of pounds,” way. Vietnam is the second largest producer of coffee, after Brazil, although to quote one source “quality of beans has limited their marketability” (Wikipedia)…well, if you packaged it with cans of condensed milk, wrapped it in holiday packaging and sold it at Costco, it would be the gift for everyone you bought a scarf for last year. It is addictive. Chicken fat: to give the beans “gloss” (future note for current dull hair problem). Ordering it (and drinking it) is an event. When it arrives on the table, a metal cylinder containing the coffee is on top of a glass containing the condensed milk. You wait, the coffee drips down slowly, and when it’s done you stir it into the condensed milk. This is not a coffee you drink hot, it’s not a coffee you drink quickly – it’s meant to be enjoyed in the way that Starbucks wouldn’t quite approve of, but those guys who spend their days writing scripts in Starbucks would, greatly. Coffee here is so ubiquitous, and cute coffee shops so prevalent, if it weren’t for the reasonable price, you’d think you were in Brooklyn. Here’s to one of the great drinks of 2017, half corn, half coffee, roasted in chicken fat and fish sauce, mixed with condensed milk- Vietnamese Coffee you are delicious enough to be dessert, but common enough that you’re also a regular beverage.